The understanding and monitoring of the various aspects of financial processes play crucial roles in the stability, sustainability, and growth of a business. We recently released our KPIs to measure for procurement, and due to popular demand, we decided to follow up with another list. There are certain high-level Key Performance Indicators (KPIs) that finance managers should be tracking if they want to stay on top of their games. This observation should be done regularly to avoid situations where organizations are prioritizing one KPI over the other. For instance, if proper monitoring is not done, managers may be prioritizing a low-cost KPI to the detriment of another KPI such as high productivity. 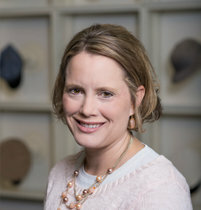 Our team at Procurify is proud to chat with another member of the APQC team – Rachele Collins, our partner responsible for financial management research at APQC, and we were able to pick useful tips from her wealth of knowledge in years of research financial management. In this post, we will be sharing with you the 4 core KPIs she suggested that your AP team should start tracking immediately so they can be on the right page in their financial management. According to Rachele, APQC’s recommendation suggests that organizations should ensure a balance of a certain set of KPIs for the AP process to be viable. In order to achieve this balance, finance managers must track 4 core KPIs in their AP process. These metrics are cost, productivity, efficiency, and cycle time. 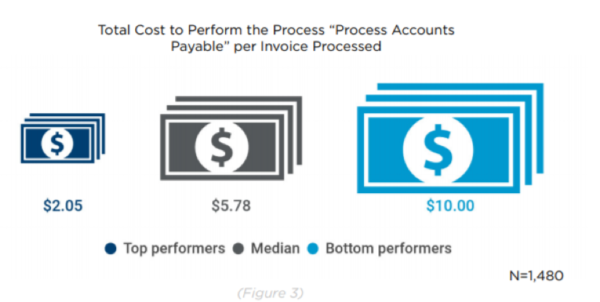 The cost KPIs measure the cost of a process standardized by factors like revenue or invoices. All things being equal, a lower number is generally better for cost KPIs. These KPIs are meant to measure the output produced per input. In this instance, a higher number is better (again, all things being equal). These KPIs are used in measuring how efficient your resources are in work performance. This measure is also standardized and is usually expressed as a percentage. Each KPI would impact the direction of efficiency metrics. These KPIs are used for measuring duration. Here, the lower or faster the results, the better for the process. When finance managers monitor a balanced set of KPIs, they create the assurance that ascertains that one KPI is not given too much attention at the expense of the other. Featuring guests from CFO.com, The Boring Company, and Yelp. 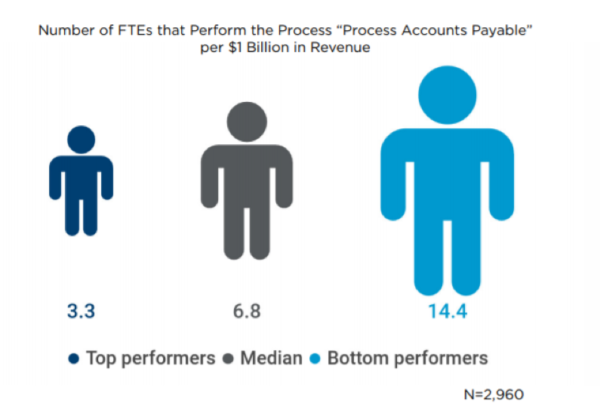 There is a significant difference between top performers and bottom performers for this KPI. Many factors can affect this KPI, including automation, looking at bottlenecks within your organization, and shifting away from manual and traditional processes. There is a big difference once again within this KPI between top performers and bottom performers, with a discrepancy of almost 80%. With the right processes and tools to support a new workflow, organizations can improve this KPI by a significant amount. Being organizationally aware of its Spend Culture could align teams and employees, to ensure standardization of workflows that will increase the efficiency and performance of the AP function holistically. 4. 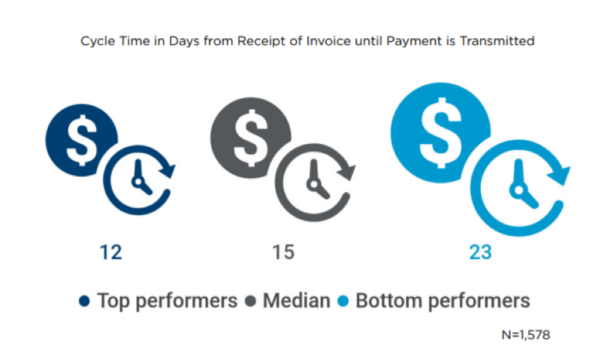 Cycle time in days from receipt of invoice until payment is transmitted. Rachele recommends that every organization should supplement these 4 high-level KPIs with additional measures such as quality or error rates as well as stakeholder satisfaction. By doing this, they will be able to pinpoint their improvement concerns. This will help organizations to improve and drive sustainable growth. New systems and technology are important to the accomplishment of the AP process, so also is management and practices standardizing. In addition, they should measure perspective and benchmark themselves both within and outside of their industry to see different possibilities about inputs, process, and outputs. 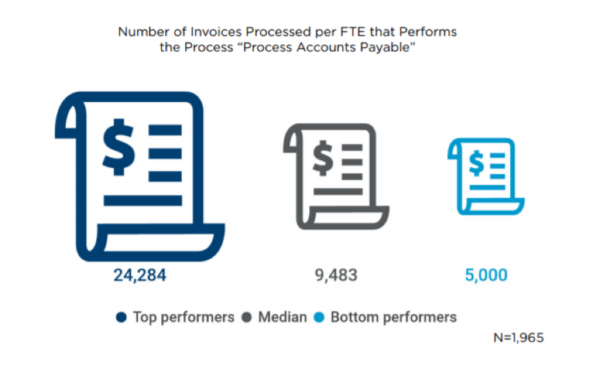 According to APQC, only 14% of all organizations have managed to implement accounts payable automation processes – which leaves a huge opportunity for organizations to rethink their processes and increase efficiency. We’re very lucky to have Rachele as a guest and contributor on Spend Culture.